The story of the Jaguars the last few years is a surprisingly simple one for a team whose record has bounced around that much: They invested heavily in the defense. It paid off in 2017 despite a subpar offense. It didn’t do as well in 2018, and the offense didn’t make up the difference. That’s really about it. Now, the team is entering 2019 still with big names and big performances around the defense, but as many questions on the offense as any team has in the league, and not much cap space to play with. 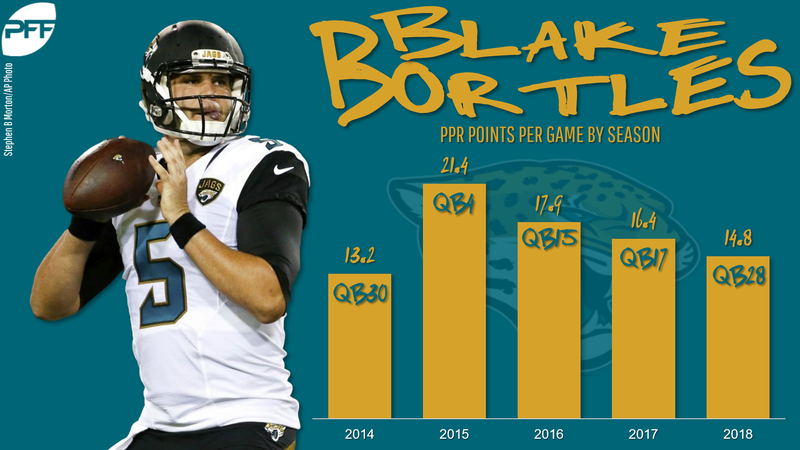 You could argue that the Jaguars don’t know who their 2020 starter is at any skill position, and if things turn south with the Leonard Fournette situation, even 2019 could be a question. In short, the fantasy wish list for the Jaguars probably goes more than three deep. But here are the three we’re focusing on. The Blake Bortles era was … well, an experience. He was startlingly good (for fantasy) in 2015, finishing fourth (!) at the position in total fantasy scoring. But even absent that year, he had flashes. He finished ninth in 2016 and 13th in 2017. If you can get a quarterback that will average a ninth-place finish over three years in fantasy, you’ll take that 100 times out of 100. The problem was that Bortles was never actually, you know, good. He’s never had a PFF grade of even 70.0 for a full season, never finished in the top 20 of PFF grades. His career passer rating (in the easiest-to-pass era we’ve ever seen in the league) is 80.9, and he’s never had a season number over 88.2. In short, yes, it’s time to move on. The Jaguars are one of two teams (the Eagles are the other) with negative cap space as of this writing, per OverTheCap. So any free agency splashes will be limited. But assuming they move around enough money to make some moves (and teams always do), they should bring in Fitzpatrick to — theoretically at least — captain the ship while whatever young QB they bring in develops. The window for the Jags’ defense to be a unit capable of headlining a successful team is closing, to the point that you wouldn’t expect it to still be a fierce group by the time any 2019 draftee is ready to run things. Fitzpatrick is 36 and among the most inconsistent quarterbacks on record, but he was the No. 1 fantasy quarterback through Week 3 last year and can offer an elite ceiling in spurts. The Jaguars don’t need an Aaron Rodgers to be a good team. They just need a quarterback who can keep things close enough for the defense to do what it does. To take advantage of the closing window, bring in Fitzpatrick. Fournette is likely to be back with Jacksonville in 2019, even if everything isn’t exactly at the peak of harmoniousness there. Donte Moncrief is a free agent after a middling one year with the team, but Dede Westbrook and Keelan Cole will theoretically be joined by a returning Marqise Lee. That isn’t a top-flight receiving corps, but it’s serviceable in the right situation. Tight end, though? Only Arizona, Detroit, and Miami got fewer PPR points from the tight end position in 2018, and with Austin Seferian-Jenkins released and James O’Shaughnessy and Blake Bell both hitting free agency, the only holdover at the position is Ben Koyack, he of 24 career receptions and zero in 2018. Whether the team tries to go big with Jared Cook or settle for the mid-tier guys like Jesse James or Levine Toilolo, someone needs to come in. And given the dearth of options across the Jaguars offense and at the tight end position at large, if it’s anyone whose name we’ve ever heard of before, he’ll become a semi-relevant fantasy name.